I’m not a pastor. I’m just someone who has given birth. I know that all births are painful, and that many babies have particularly challenging births. My kids were of those. Subsequently, the references in the Bible to creation “groaning in the pains of childbirth” and “the beginning of birth pains” have taken on a lot more meaning for me. Braxton Hicks contractions, also known as prodromal labor or practice contractions, or false labor, are sporadic uterine contractions that sometimes start around six weeks into a pregnancy. However, they are not usually felt until the second trimester or third trimester of pregnancy. Braxton Hicks contractions are often infrequent, irregular, and involve only mild cramping. As pregnancy goes on, Braxton Hicks contractions go from unnoticeable amounts of pain signals to irregular, infrequent cramping to strong frequent cramping and then finally labor pains. The Church Age will be marked by false messiahs, false doctrine, wars and rumors of wars, and trials and tribulations of many kinds, but the end is still to come. Indeed, there have been many offshoots from Christianity proclaiming “partial truths” throughout the last 2 millenia – bearing the name of Christ but not acting in Godly character nor professing salvation through Jesus’ atonement alone. There are many religions (including “Christian” ones) who have added prophets or books or personal interpretations onto the Bible. We can also think of horrible atrocities that have been done (and are still being done) in the name of religion. Even though many of these were done in the name of “god”, I can assure you that they were not done for the One True God. These things will all be present in the Church Age… but the end is not yet. The labor pains continue throughout the time of tribulation (~7 years). These pains include all the effects of the seals, as well as the trumpet and bowl judgments of God. It also includes the deception and wrath of satan. The last 3.5 years involve the worst pain – “For then there will be great distress, unequaled from the beginning of the world until now—and never to be equaled again.” (Matthew 24:21 ESV) Finally, at the Second Coming of Christ, the earth will be delivered of its’ suffering. Out of Bethlehem, the Messiah came forth. 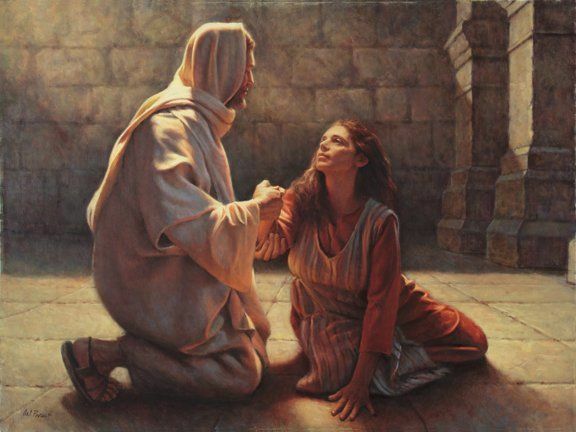 He is the one who will be ruler over her, but because it did not happen as she imagined, Israel rejected Him. Israel was thus scattered among the nations as prophesied. We see this foretold throughout the Old Testament as well as by the prophet Ezekiel. This is the mystery of the “partial hardening” of Israel until the fullness of the Gentiles is complete (Romans 11:25). The fullness of the Gentiles will be complete when the last one has entered into the new covenant in Jesus’ blood, at which point the body of Christ will be fully formed. Israel will be given up until the time when she who is in labor has given birth, then Israel will be regathered. Using an interlinear translation, we see the woman give birth to a male huion arsen (Strong’s 5207 and 730). This male child is to shepherd the nations with a rod of iron. The woman is identified as Israel (the corporate entity), who brings forth Jesus (the male child – huion arsen). A child, teknon (Strong’s 5043), is then caught up to God and to His throne. Now here’s a question for you – is the child who is birthed the same child that is caught up? Isaiah 26 is particularly interesting in that it is an Old Testament passage that connects the dead rising (resurrection) and God’s people entering their chambers to hide (rapture) right before God’s wrath begins. From Isaiah 66 we know that “before she was in labor she gave birth”. This is entirely consistent with Jesus telling us that when we BEGIN to see all these things (the beginning of birth pains sign He describes on the Mount of Olives), that our redemption draws near. As Israel enters her birth pains, the time of Jacob’s Trouble, the body of Christ will be delivered. The nation that is born in one day is the body of Christ (1 Peter 2:9). For further support for this model, note in Rev 2:26-27 that the overcomers in Thyatira – but applicable to all believers – will receive authority over the nations and rule them with an iron rod, just as Jesus received authority from His Father. Our birth is “already but not yet”. Once the body of Christ has been birthed, THEN “the rest of his brothers shall return to the people of Israel” (Micah 5:3). This regathering of Israel occurs during the 70th week of Daniel (the “tribulation”, “time of Jacob’s trouble”), and is completed at the Second Coming of Christ. God will deliver the remnant of Israel as foretold, right before Jesus is inaugurated into His Messianic Kingdom (Micah 5:4-5). All of creation has been yearning to be freed from death and decay since the fall of humanity. The church age has been marked by the “practice contractions” of tribulation. These have been ramping up for some time now – increasing in frequency and severity. For Israel, the church age is marked by God’s silence towards them. It seems that God will remain silent towards Israel until the birth of the church. At some point soon, Israel is going to enter the birth pains of the Time of Jacob’s Trouble. But before she labors, the body of Christ will be truly “born again” and safely delivered to heaven. At this point God will again turn to Israel and focus on bringing His chosen people back to Himself – “as a hen gathers her chicks” (Matthew 23:37). I encourage you to watch the last 8 minutes of Scott Clarke’s exposition of the conception and birth of the church HERE. He suggests that we are “conceived” at our salvation, and “birthed” at our redemption; this is an interesting picture because if the “seed of the woman” isn’t fertilized by the “seed of the Father”, it is destined to die. What a somber picture of those who reject God’s offer of eternal life.